Heat the oil in a 6-quart (or larger) Dutch oven over medium heat. Add the onions and cook, stirring occasionally, until the onions are softened and just starting to brown, 6 to 8 minutes. Add the garam masala and cook, stirring constantly, until fragrant, 45 seconds. Add the broth, tomatoes and their juices, lentils, celery, carrot, garlic, cayenne, 1/2 tsp. salt, and 2 cups water. Bring to a boil over high heat, stirring frequently to keep the lentils from sticking; skim any foam as necessary. until the lentils, carrots, and celery are tender, 35 to 40 minutes. Season with salt to taste. Store leftovers in the refrigerator for up to 5 days. It only gets better! 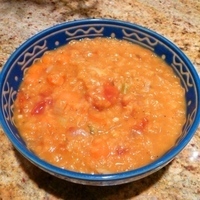 I actually liked this even better than John's Turkish red lentil soup recipe. It's a bit lighter and a bit spicier. If you've never had a red lentil soup, it's a little like French Onion Soup or Thai Tom Ka Gai: you just have to try it to believe it. Wonderful! I just made this for dinner and it was great. We had it with home made Whole Wheat Irish bread. Glad you enjoyed it Elaine! Thanks for the thoughtful review and side suggestion. So glad you enjoyed it Phyllis. Thanks for taking the time to review it! This soup is wonderful. So easy to make and such a fantastic taste. We love red lentils, and the spices look interesting. I'll be trying this soup real soon. Looks nice and hearty for the winter. I hope you enjoy it Judee! This is bubbling on my stove right now, made with vegetable broth and smelling splendid! Can't wait. I hope you enjoy it Phyllis! Please add a rating/review after you've tried it. This caught my eye immediately. I made a mixed lentil soup last week - this is next. Hope you enjoy it Katie. It's remarkably good!